Strong Work (and Play) Ethic. You’re always ready to get up at dawn and won’t stop working until the job is done right. The Honda Foreman is no different. That’s because our engineers work tirelessly to make sure our ATVs can handle a wide variety of tasks and adventures, big, small, tough or fun. The soul of this go-to tool is its proven fuel injected 500-class engine that delivers plenty of power and fuel efficiency. 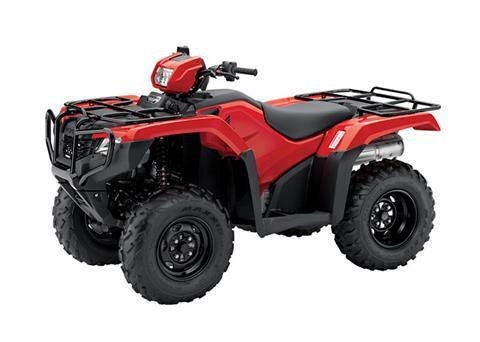 The strong, refined chassis offers a long suspension stroke for a smooth and nimble ride that’s perfect for rough terrain. The Foreman’s driveline works hard for you by maximizing front-end power transfer and traction. And finally, all of these features are wrapped up in some tough, aggressively styled bodywork and new color choices for 2018. This package really works.